YB, you don't light my fire! I must introduce you to Azri, a restaurant owner in the city. My friends and I had breakfast at his restaurant last Friday. Customers range from soldiers, office workers, contractors and nearby residents. They normally fill every table. This is one of the more convenient shops to have breakfast. At night, many youngsters gather around to watch the English Premier League games. Apart from the usual fare of nasi campur, Azri also serves Thai food, freshly cooked, and other local dishes, such as nasi lemak, roti canai and tandoori chicken. Azri joined us with a mournful look on his face. He went on and on about the “No Smoking” campaign in restaurants. I told him the ban is not just at restaurants, but at public places as well, implying that restaurants are not being singled out. Yes, he’s aware of that, he said. He has no complaints about the “No Smoking” ban per se. But the campaign has adversely affected his income. In the days following the ban, which took effect on Jan 1, his revenue has declined steadily and surely. He showed us his accounts — a drop of between 30 and 50 per cent a day! Less and less of the smokers are dropping for a meal and teh tarik. I could see that last Friday. It used to be bustling with all sorts of people having breakfast. Last Friday, only about 10 per cent of the tables were occupied. Azri said his business really suffered. Shop rental is not cheap, wages to staff remain the same even when there are fewer customers. It’s the same with the electricity bill. There’s really nothing much I can do to help Azri, who has been in the food business for a long time. I like YB’s idea of discouraging smokers to quit. I’ve been doing my own campaign among friends and relatives, with little to no success. This new initiative has attracted much attention, and in some instances created an uproar among smokers. From what I can see, now even restaurant owners are unhappy, and for good reason. YB Dzulkefly, as the health minister, you and your team of officers may want to revisit this programme, which, as you had said, would be more educational in nature for the first six months. I’m sure your researchers would be collecting data from all over the country. You must surely know a lot of people are making fun of your campaign. Photographs of smokers using measuring tape to ensure they smoke three metres away from restaurants have gone viral these past couple of weeks. Do you smoke, YB? I used to smoke two packs a day, a combination of the Indonesian clove cigarettes and a locally manufactured international brand. After smoking for more than 20 years, I quit on the advice of a medical doctor. Two medical doctors, in fact, one of whom I’m very sure you know! This campaign of yours has a side effect that may affect the national economy. It may sound a bit of an exaggeration. But if food and beverages outlets like Azri’s restaurant are suffering, you may want to seriously go back to the drawing board and come up with an alternative plan. I’m all for a “No Smoking” campaign. Making people smoke three metres away from restaurants won’t make them stop lighting up. Women, too, have picked up this habit. When I stopped smoking, I saved quite a bit of money actually. But that was when a pack of cigarettes cost way below RM10. There was a time when meeting rooms were filled with cigarette smoke because it was not regarded as rude or unbecoming, much less an offence. 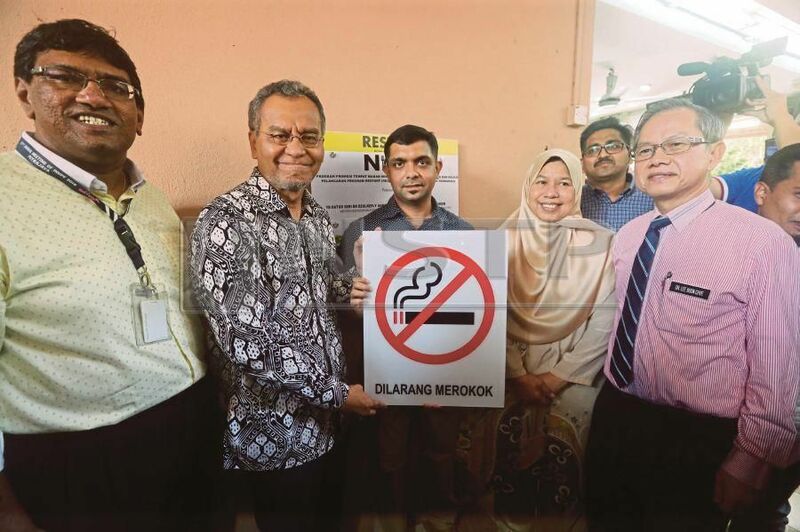 But when Tun Dr Mahathir Mohamad, as the fourth prime minister, showed his displeasure at the smoking habit, smokers quietly sneaked away to the toilet to get a quick fix. Questions: Can rules like the three-metre gap stop people from smoking? Is there no other more intelligent way of encouraging smokers to stop lighting up? Who will enforce the rule? I’m sure there must be other ways to encourage smokers to stop. Increasing the price of cigarettes may be one, but this will encourage the smuggling of cigarettes. The die-hard smokers won’t quit, that much you must have already known. Continuously educating them is a must. Positive arguments, forums and workshops, economic benefits, threats to health and repeated counselling need to be structured and implemented consistently. This latest campaign has triggered a side effect. Genuine restaurant operators say they are suffering. They appear to be innocent bystanders caught in friendly fire. Or just collateral damage? Knee-jerk reactions and campaigns won’t work, YB. Believe me.